Many organizations built their mission-critical applications with tools, which were serious and robust for their time. Software companies invested in frameworks for those tools. Billions of code lines have been written by thousands of trained developers. Organizations invested in the infrastructure assuming that they invested in a platform that will remain vibrant over the years. However the forces of the market thought otherwise. Those tools are now niche players in the application development tool market. The number of new installments diminished. Professional personnel are becoming scarce. But there are many enterprises with deployed active legacy applications. These enterprises must maintain their current systems. Every system in production has to deal with dynamic changes and enhancements. Enterprises are at a point where they have to make a strategic choice: to continue building applications with the existing legacy tools where there is no future, or to move to another platform. 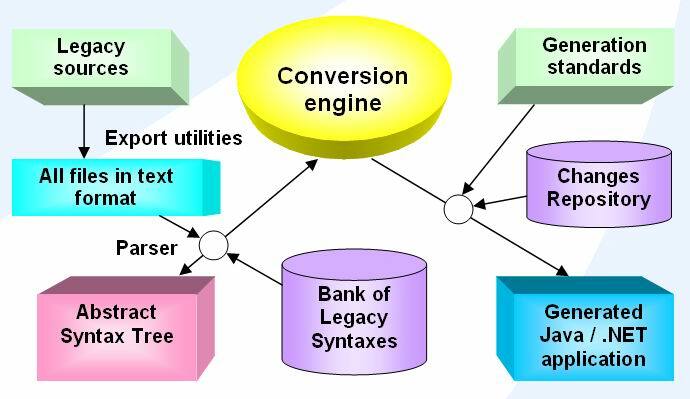 MainTrend’s Legacy to Java (Enterprise Edition) or to .NET conversion opens a seamless way to migrate legacy applications to the modern environment. MainTrend’s modernization strategy provides both client-server to thin client architecture upgrade and high quality of the resulting code. Based on MainTrend’s proprietary toolset, automated conversion as a replacement methodology saves all the investments in business knowledge and opens the way to maintenance and further development in a new modern environment. Legacy systems, even though they answer to the business needs of organizations, are very costly in maintaining. The new development is being done with the modern tools, that is, the organizations should maintain a number of platforms simultaneously. Legacy maintenance costs take a significant part of the IT budget, preventing IT from using funds for new projects. Also lack of personnel with required skills and even lack of clear business knowledge of the legacy systems themselves make keeping their functionality up-to-date very expensive. We live in a rapidly changing world. Fierce competition requires business and aligned with it IT systems to be highly agile. New features and new functionality are required almost daily. However, legacy applications are very difficult to scale or adapt; they can not be easily integrated with other software; and as a result, all the systems may have not enough capacity or computing power to support the business needs. Sometimes, mostly for government agencies, a wide unification initiative spreads across different organizations. To comply with the new regulations, organizations have to align their business activity and supporting these activities software. And legacy applications are the first candidates for modernization. Compared to manual rewriting, automated conversion as a modernization technology is much faster, much cheaper, and also ensures that all the business knowledge is preserved. The resulting application is similar to the original one, so the learning curve for the end users and for the maintenance team is not as long as with a “rewritten” application. We have more than 10 years of extensive experience with migration projects. We successfully handled projects of different sizes for different clients – from small companies to large corporations, financial organizations and government structures. Our expertise in software architecture design, databases, application programming and decision-making systems, together with deep knowledge of many different platforms, helps us to provide state-of-the-art service for our customers. We are always open for mutually beneficial partnership. Some joined modernization projects we did with HP and Oracle. For critical milestones (such as initial analysis and project kick-off, integration test, user acceptance and going production) our top-level consultants can be present on-site. If required by the nature of some modernization projects, we can work with local partners being present on-site at the customer’s premises during the entire modernization project. Having a strong back-end (our well-trained professional teams working at our central location) allows our front-end top level consultants and local partners to fulfill their part of work in the best mode.